One of the first things you might notice as a visitor to Amsterdam is that bikes are everywhere, and there is no shortage of places to see and visit by bicycle. This is also true for the Amstel River – which runs right through the centre of this historical and beautiful city – and offers an interesting, relaxing and scenic way to see Amsterdam. In fact, it is from this river that Amsterdam got its name. (The river got its name from the term “Aeme-stelle,” an old Dutch term meaning “water-area.”) The river is also responsible for naming one of Holland’s most popular beverages: Amstel Beer, which was originally established in 1870 near the river itself. 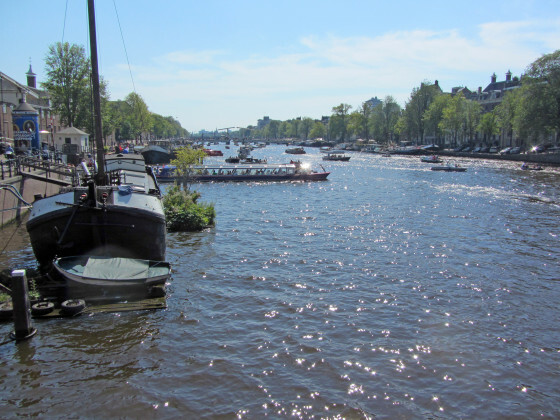 Much like the Seine, the vibrant Amstel River has been a source of inspiration for some of the world’s most famous artists, including Rembrandt and Aert van der Neer, among others. 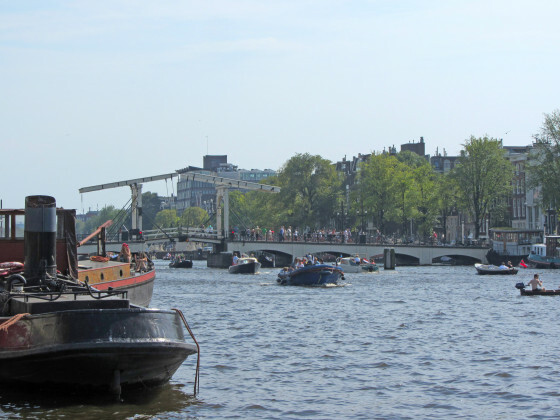 Over time, the Amstel River has also become an important cultural and social gathering place for locals and visitors. After all, near the banks of this river is where you’ll find some of the city’s most popular cafes, bars and attractions – including the Stopera, one of Amsterdam’s most important buildings. 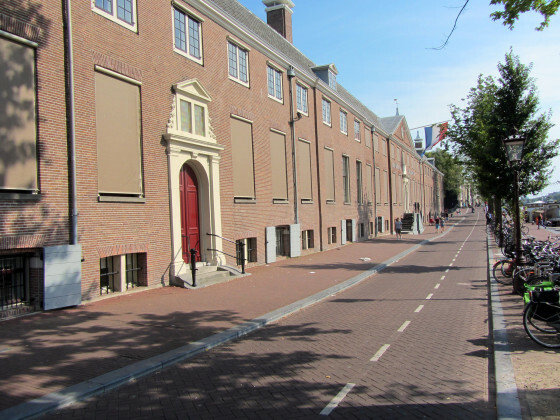 The Stopera is home to City Hall and the Dutch National Opera & Ballet. The river is also home to an array of concerts, rowing races and the Canal Parade, the city’s yearly floating gay pride parade. You can start your own self-guided bike tour at most any point along the river or at any of the three bridges that cross the Amstel: Magere Brug, Blauwbrug, Hoge Sluis and Berlagebrug. Heading away from the city centre and biking south of the A10 Highway, you’ll find Amsterdam’s bustle soon giving way to a scenic countryside setting with many opportunities to rest, take in some sights and grab a refreshing drink along the way. En route, stop in for a beer and a bite to eat on the outskirts of Amsterdam at the Klein Kalfje – a pretty red-bricked building with a bright and comfortable outdoor seating area. This popular local hangout sits on the west side of the river, and is known for its impressive menu and lively scene. 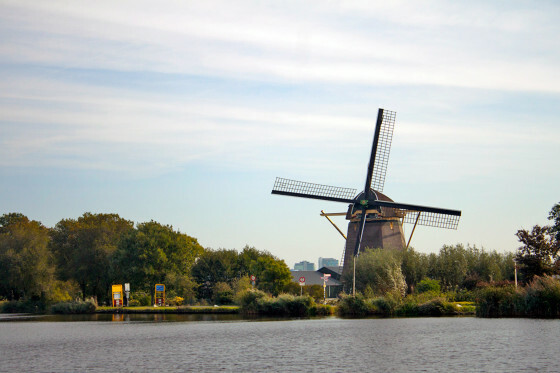 From here, it’s a quick two-minute ride to the historic windmill De Riekermolen, also situated on the west side of the river near Amstel Park. Dating back to 1636, the windmill was used in a bygone era for draining a nearby parcel of land. Visit the site on Saturdays and Sundays between the hours of 12:00 to 17:00 from May through September, and you can catch it spin (provided there is enough wind, naturally). Near the windmill, you’ll also find a statue of the famous Dutch painter Rembrandt, whose sketches were inspired by the area’s scenic setting. Before circling back, be sure to stop at De Zwaag – another pretty windmill on the east side of the Amstel River. To get here, head south to the bridge at Ouder-Amstel, cross the river and then come back along the east side of the river. Once you’ve taken your self-guided tour around De Zwaag, continue north of the A10 Highway until you once again reach Amsterdam’s city centre. Of course, this is just one of many bike routes to help you explore Amsterdam and the Amstel River. For an alternate route along the river, try exploring the Ronde Hoep.